It is summer time! And now is a good time to pay attention to your skincare. You may not be getting any younger, but that doesn’t mean your skin has to suffer the consequences commonly associated with aging. Simply tweaking a few habits can have a profound effect on the health of your skin. Many toxins are naturally excreted through the skin, which is why internal damage caused by poor lifestyle and nutrition can wreak havoc on skin quality (1). Fortunately, there are many things you can do on a daily basis to maintain a healthy glow. Protect yourself from the sun: Long-term sun exposure can cause wrinkles, dark spots and can increase your risk of skin cancer. Spending a little time in the sun each day helps your body produce essential Vitamin D (2), but too much sun can cause skin damage. Use a broad-spectrum sunscreen with an SPF of at least 30 (even on cloudy days), and don’t forget to re-apply every couple of hours (3). Drink plenty of water: Proper hydration is essential to maintain a youthful complexion. Even mild dehydration can cause the skin to become dry. Make sure you are drinking enough water throughout the day. The National Academies of Sciences, Engineering, and Medicine determined that an adequate daily fluid intake is about 15.5 cups for men and 11.5 cups for women (4). Eat foods with antioxidants: Antioxidants are vital to healthy skin because they reduce skin damage and inflammation. Research shows that eating foods rich in antioxidants can restore healthy skin while also protecting skin from the sun’s damaging rays. Some of the best sources of antioxidants include blueberries, green leafy vegetable and melons (5). Be tobacco free: Aside from increasing the risk of lung cancer, smoking makes your skin look older and contributes to wrinkles. Smoking damages collagen and elastin – the fibers that give your skin strength and elasticity. Engage in activities that relieve stress: Chronically elevated stress levels can trigger acne breakouts and other skin problems (6). Find an activity you enjoy and do it regularly. Consider yoga, walking, and meditation to reduce stress. Your skin will thank you! Check with your skincare professional for more tips to help your specific skin type. Krohn, J. (1996). The Whole Way to Natural Detoxification. Vancouver: Hartley & Marks Publishers. Mostafa, Wedad Z., and Rehab A. Hegazy. “Vitamin D and the Skin: Focus on a Complex Relationship: A Review.” Journal of Advanced Research6 (2015): 793–804. PMC. Web. 6 June 2018. Maleki, Aryan, and Noorulain Khalid. “Exploring the Relationship between Stress and Acne: A Medical Student’s Perspective.” Clinical, Cosmetic and Investigational Dermatology11 (2018): 173–174. PMC. Web. 6 June 2018. What does it mean to have Physical Wellness? Physical wellness means getting adequate sleep, eating a healthy and balanced diet, being physically active every day, and getting an annual medical check-up (1). Why is Physical Wellness Important? Physical wellness is important because your body needs to be healthy so you can perform to the best of your ability in all areas of your life, including academically. Physical activity is just one aspect of physical wellness. It also includes managing your stress, getting enough sleep, and eating a healthy diet. Many college students struggle with getting enough sleep. Staying up late to cram for an exam or write a paper can be counterproductive because you will accrue sleep debt. If you are sleep-deprived, your memory will not be as good and you will not be able to learn efficiently or focus your attention. Also, sleep, stress and physical activity are all connected. If you are physically active, you will reduce your stress level and will probably sleep better as well. How do you cultivate Physical Wellness? To cultivate physical wellness you must get adequate sleep (7-9 hours) every night (1). Aim for 30 minutes of moderate intensity exercise per day. Incorporate strength training and stretching into your exercise routine (5). You can achieve a balanced diet by eating at least 5 servings of fruits and vegetables per day (1 serving = about 1 cup), eating whole grains and, if you eat meat, make sure the protein is lean (e. g., fish, chicken). Limit saturated fats, but consider including more unsaturated fatty acids found in foods such as chia seeds, avocados, and salmon (6). Avoid consuming trans fats (6). In general, make sure to eat a variety of whole foods to get the most out of every meal (7). During finals week, most students would agree that their stress level increases, while the number of hours they spend sleeping decreases. This might sound like old news, but did you know that stress and sleep directly affect your overall health and wellness? Increased stress can lead to decreased sleep, and both can lead to lower academic performance, more illness, weight gain, and increased mental health issues. One way to decrease stress and improve sleep is to incorporate relaxation into your daily routine. Research shows that practicing relaxation techniques may result in recovery from fatigue, better sleep quality, and an increased sense of control and efficacy in stressful situations. Relaxing includes taking a walk in the park, deep breathing exercises, meditation, or yoga. Try the free yoga classes at the Student Health Center from 4-5pm on Wednesdays and Thursdays all fall semester and through finals week. In addition to stress, sleep can be affected by the blue light that is emitted from electronic screens. Blue light delays the release of sleep-inducing melatonin, increases alertness, and interrupts your circadian rhythm. Normally, the pineal gland in the brain begins to release melatonin a couple of hours before bedtime, and melatonin reaches its peak in the middle of the night. When people use a device that emits blue light (like cell phone) in the evening, it takes them longer to fall asleep and they tend to spend less time in a deep sleep (1). Interested in learning more about sleep? 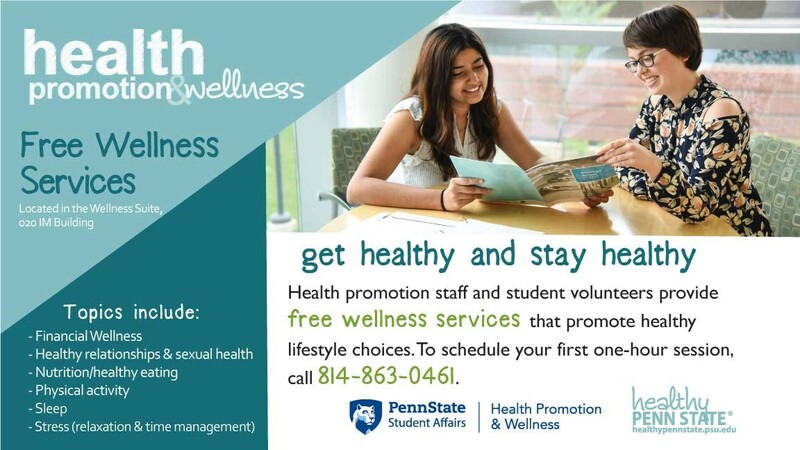 Health Promotion and Wellness offers free one-on-one wellness services to students. Topics include stress and time management, sleep, physical activity, nutrition, healthy relationships and sexual health, and financial wellness. HealthWorks peer educators provide the services. 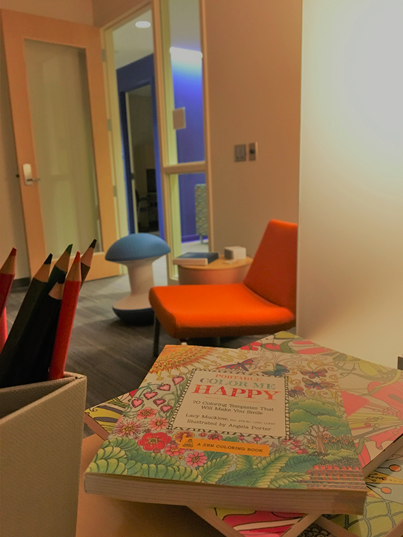 These services are FREE and are in the Wellness Suite, 020 IM Building. To schedule an appointment call 814-863-0461. Each service includes three 1-hour sessions. Trained peer educators deliver the services. 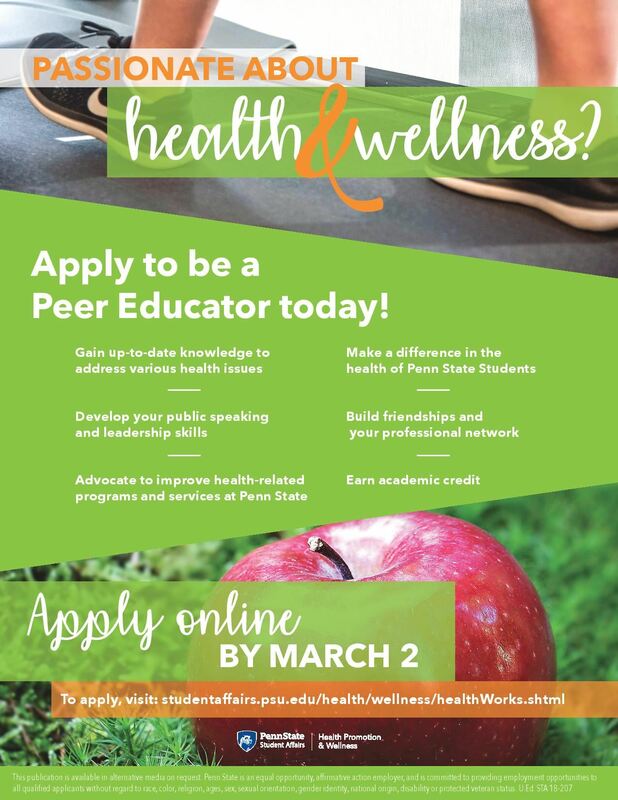 Students can schedule an appointment by calling 814.863.0461. The services are located in the Wellness Suite, 20 Intramural Building.